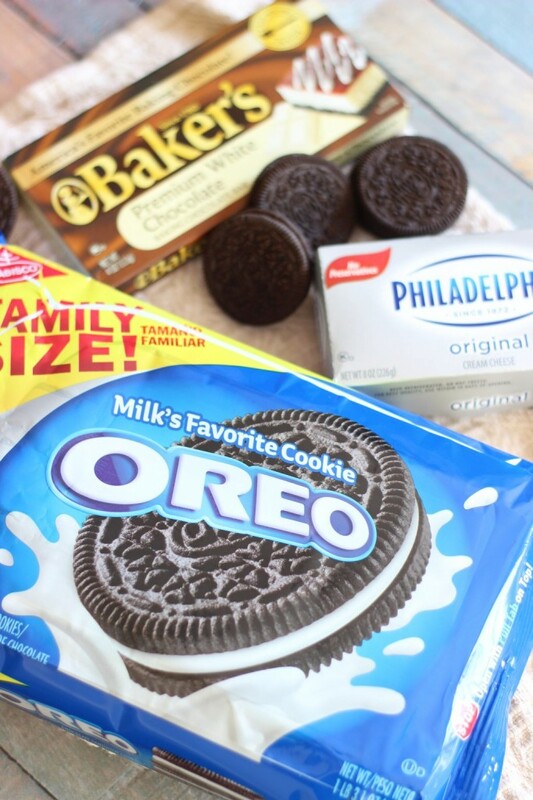 I love OREOs, and they are easily my favorite cookie from the grocery store. I’m addicted to Golden Double Stuf OREOs. I am also quite passionate about the Golden Birthday Cake OREO Cookies (all-time fave), and I’m in love with the limited edition Pumpkin Spice flavor. They are fantastic. Pumpkin Spice is a tough flavor to pull off so that it tastes authentic, but these cookies nail it. But there’s something to be said for the original OREO Cookies too, and I’ve always enjoyed making them into OREO Cookie Balls. 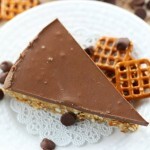 The recipe is so simple and easy. There’s only a handful of ingredients, and no oven required. Cookie crumbs mixed with cream cheese, rolled into balls, and dunked in chocolate – what’s not to love? The recipe is also very versatile. 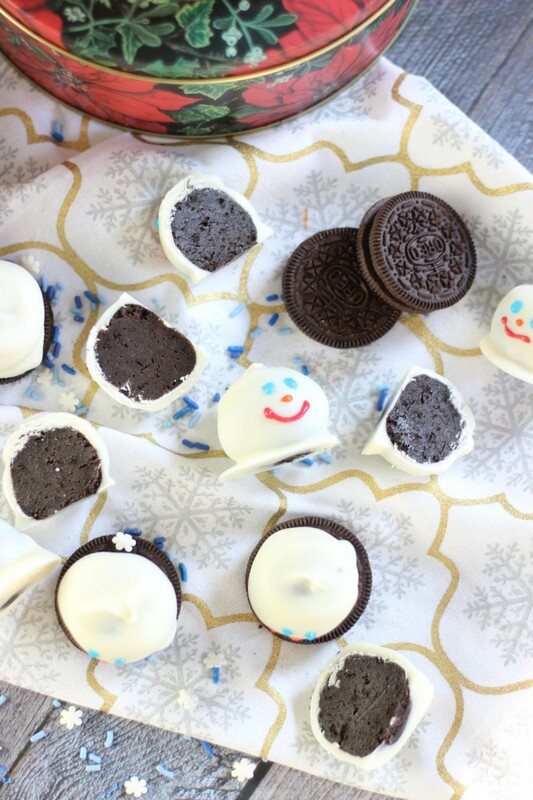 You can use any flavor of OREO Cookies and you can decorate them for any occasion. 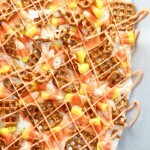 You could decorate them into footballs or football helmets for game day parties, turkeys for Thanksgiving, or dip them into orange sprinkles to make pumpkins. There’s so many possibilities. When I was making them over the weekend, the first idea that came to mind for decorating these OREO Cookie Balls was snowmen. Interesting, since it was Halloween weekend. Also, it was basically a heat wave here in FL.. it felt like summer. Really, could’ve been middle of July for how hot and muggy it was outside. Yet, my mind was on snowmen. Well, that’s why I dubbed these ‘melting’ snowmen though! It felt more fitting, considering the heat. It only took a few days for me to feel like I can get into the right mindset for Thanksgiving and Christmas. Even three days ago, I wasn’t ready, and I couldn’t believe it was November, but now that Halloween is over, I’m ready for the upcoming holidays. I really think a lot of it had to do with making these OREO Cookie Balls. 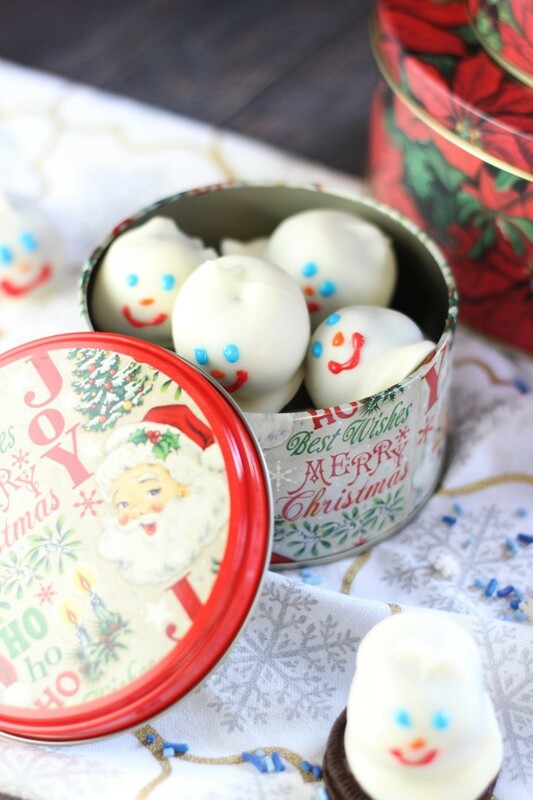 They are cute and festive, and it got me excited for all sorts of holiday activities… movies, baking, decorating, all of it. 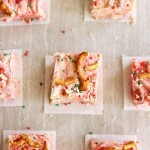 Besides that they’re simple and delicious, making a batch of these might put you right in the holiday spirit! 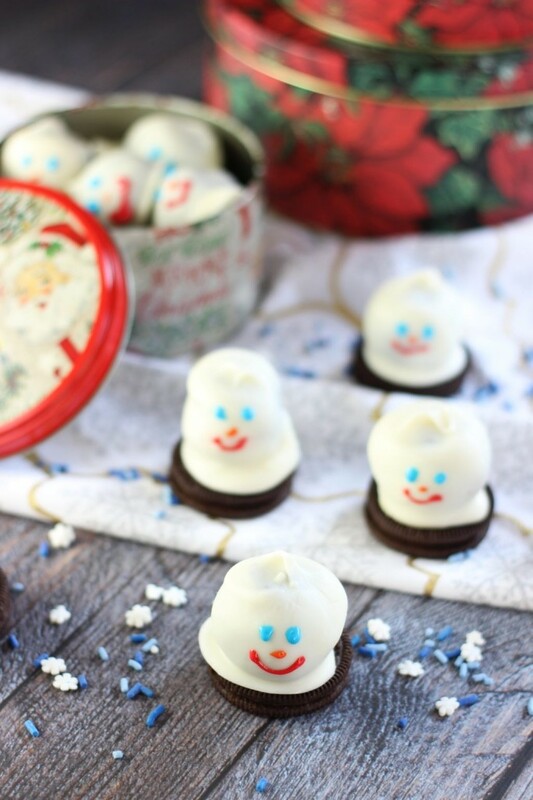 Oreo Cookie Balls decorated as melting snowmen! Shape into 48 (1-inch) balls. Freeze til solid, at least 1 hour. The cookie balls should be very cold and firm. 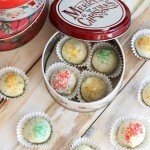 Dip balls in melted chocolate, and do not tap off excess; place in single layer on a shallow waxed paper-lined pan. 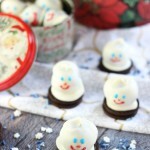 Decorate with icing to resemble snowmen. 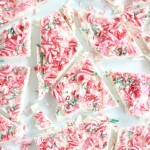 Be sure to use melting chocolate or white chocolate almond bark for dipping. White chocolate chips do not melt as smoothly for dipping as chocolate that is made for melting. That’s so true! Kids would really love making these. Thank you!! Those are really cute. You really can’t beat Oreos. These are so super cute! 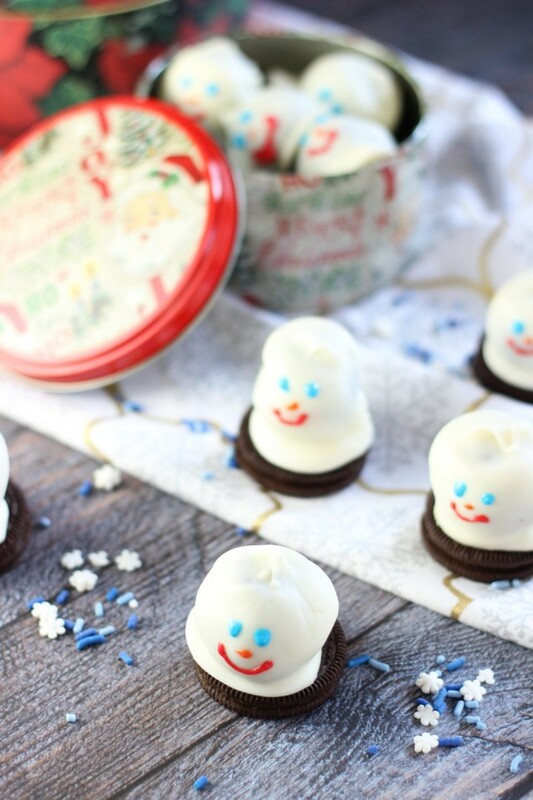 I’ve actually never made those Oreo balls before, but I think I need to try them this year! They are delicious – and I think what’s fun about them is you can shape them and decorate them any old way! Thanks, girl! These look so cute and absolutely delicious Sarah! Pinning! These melting snowmen cookie balls are so adorable, Sarah! I love that you made them with Oreos, they’re my favorite store-bought cookies too 🙂 These are perfect for the holidays! Thank you so much! 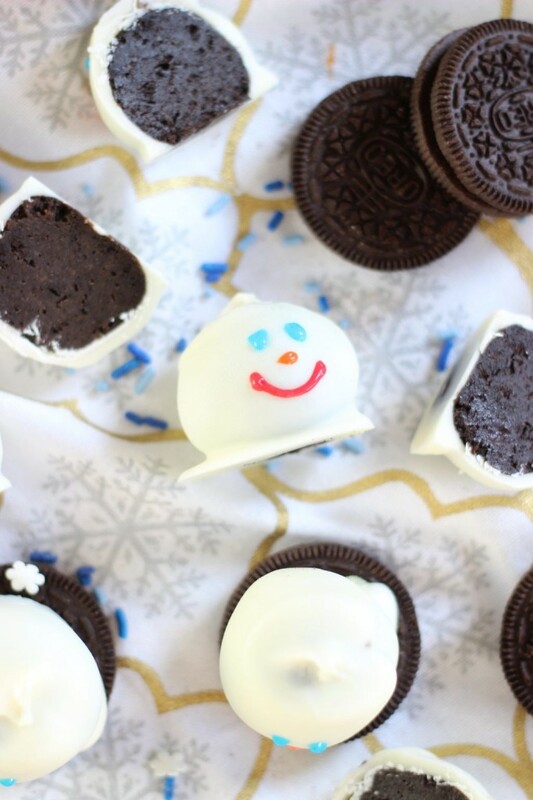 I’m totally hooked on OREOs and the cookie balls are so delicious and easy! I’d love to try these. I’d also like to cover them with dark chocolate instead of milk. Couldn’t be a snowman then….I’ll have to think about that one. 🙂 Thanks for sharing! Haha! That’s true – couldn’t be a snowman, but you could probably come up with another idea! They’d be delicious coated in dark chocolate! I love oreo balls, they are my weakness. These are just so special. what a great idea. Do you think it will ever cool down here in Florida? It is hard to get in the holiday spirit when it is so warm. Pinning these. Most adorable! I’ll make them for Thanksgiving! Fun! Adorable! Thanks for sharing on the #HomeMattersParty . I hope you will join us again next week.